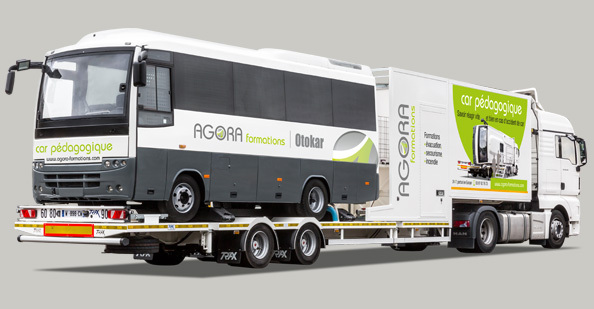 The Training Bus, an innovative training tool. The only one of its kind in Europe. Your drivers’ behaviour is crucial, so that passengers may be evacuated swiftly, and their safety be ensured in the event of an accident. Bus driver training programs include evacuation drills, but the bus is always in a normal upright position on all its wheels. 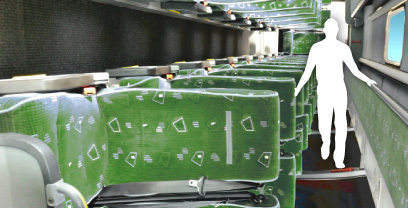 However, in the event of an accident, public transport vehicles tend to roll over onto their sides, thereby rendering evacuation conditions even more difficult. This is why AGORA Training Centre, (AGORA Formations), workplace safety specialist, developed an innovative simulation tool in association with MENGEL, French manufacturing company based in Xertigny, which built this device. Our goal: to give drivers and passengers the opportunity to practise in a bus lying on its side, so they can react appropriately in the event of an accident. An ultra-realistic evacuation drill in 3 steps! 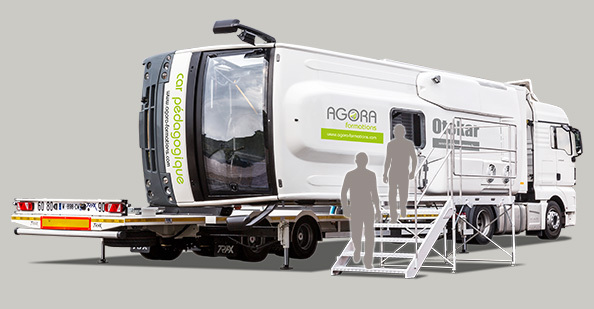 The Training Bus allows participants to move around in a bus lying on its side. In this position, seats and luggage turn into real obstacles and the roof hatch is the only way out. Your drivers’ behaviour is crucial, so that passengers may be evacuated swiftly, and their safety be ensured in the event of an accident.